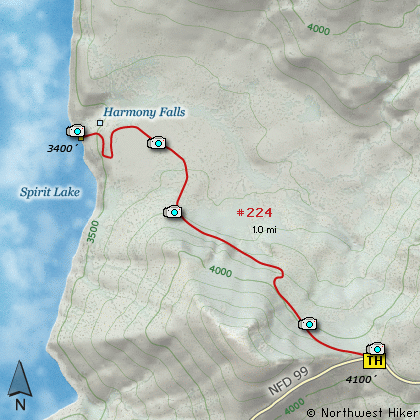 Here is an outstanding little hike, that would be considered Challenging if it wasn't so short. You begin the hike at a parking area along Forest Road 99. The trail descends immediately and steeply toward Spirit Lake. Be aware that this is the only way you can legally reach the shore and touch the water of Spirit Lake. Also be aware that it is illegal to stray from the trail at any point. The treeless landscape offers great vistas all along this hike. You will pass through some small new trees and shrubs that have grown since Mt St Helens exploded in 1980. In season this is a very floral hike. As the signs request, you must stay on the trails provided for your use. The steepest part of the trail is the part closest to the trail head. As you near the lake, the trail levels off. The trail crosses a sea of pumice left over from the violent explosion of Mt St Helens. The views of Mt St Helens from this prospective are unique and inspiring. The trail takes you right up to the edge of Spirit Lake. The lake has thousands of logs still floating on it from the devastating event of 1980. As the trail approaches the lake, Harmony Falls will be right beside you. From Woodland follow SR 503 and the Lewis River Road for about 48 miles to the community of Cougar, WA. From Cougar, continue east on the Lewis River Road which will turn into Forest Road 90 after you enter the Gifford Pinchot National Forest. In about 18.5 miles you will come to the junction of Forest Road 25. Forest Road 90 makes a right turn, downhill at this junction, but you will need to continue straight ahead on what is now FR25. Follow FR25 north for approximately 25 miles, passing the Cedar Flats Natural Area, and the junction to Forest Road 93, which takes you to the Craggy Peak hike and the Hat Rock Overlook hike, past Elk Pass and the junction of Forest Road 28 which leads to the Craggy Peak hike, and finally you will come to Forest Road 99 on your left, which is the road that leads to the Windy Ridge side of the Mt. St. Helens National Volcanic Monument and many hikes. If however, you plan to approach this hike from the Columbia River Gorge area, then begin at Carson, Washington and head northwest on the Wind River Hwy. In 7.5 miles you will pass through the little community of Stabler, and in another 5.8 miles you will come to the junction of Forest Road 30. Turn right onto FR30 and follow this road for 13.2 miles north along the Wind River and then up a steep incline and onto a plateau where	you will come to the junction of the Curly Creek Road. Turn left onto the Curly Creek Road and follow it downhill past an excellent view area for about 5.1 miles until you come to Forest Road 90. Turn left onto FR90 and follow it for about 4.1 miles. You will descent to and cross the Lewis River then come to the junction with Forest Road 25. Make a sharp right turn onto FR25. Follow FR25 north for approximately 25 miles, passing the Cedar Flats Natural Area, and the junction to Forest Road 93, which takes you to the Craggy Peak hike and the Hat Rock Overlook hike, past Elk Pass and the junction of Forest Road 28 which leads to the Craggy Peak hike, and finally you will come to Forest Road 99 on your left, which is the road that leads to the Windy Ridge side of the Mt. St. Helens National Volcanic Monument and many hikes. Go south out of Randle on SR 131, cross the Cowlitz River, and you will come to Forest Road 23 on your left. Stay on SR 131 heading south and soon this road will become Forest Road 25. Continue south on FR25 for almost 20 miles and you will come to Forest Road 99 on your right. After turning onto Forest Road 99, you will climb westward for about 9 miles before coming to Forest Road 26 on your right, which takes your to the Norway Pass TH and the Goat Mtn TH. You continue on for a very short distance, and you will pass the trailhead for the Meta Lake hike. Continue along FR99 for about 3 miles and you will pass the trailhead for the Independence Pass hike. Continue on FR99 for just over another mile and you will come to the trailhead for the Harmony Falls hike.